As a pricing consultant, I am frequently asked by companies from all sorts of industries to assist them in a move to Value-Based Pricing (VBP). These companies tend to be acting proactively and initiate the move to Value-Based Pricing themselves. So what is Value-Based Pricing and why do companies initiate the move? Value-Based Pricing is where a company monetises part or all of the economic value it creates for its customers. The economic value is created by the vendors’ products and services either increasing the client’s revenue, reducing their costs or minimising their risks. These three sources of value are not necessarily mutually exclusive: some products can increase revenue and reduce costs, for example. One of the most commonly cited reasons by companies for shifting to Value-Based Pricing is that their customers don’t buy from them because of what it costs the vendor to provide the product or service purchased. They buy from them because of the value they receive. 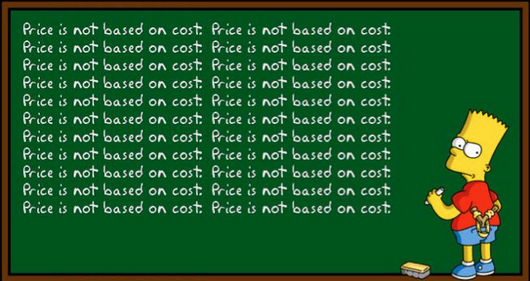 If the research is to be believed, then the 70% - 80% of companies that resort to cost-plus pricing are pricing on a dimension that their customers just don’t care about. To put it another way, cost-plus pricing (like billing by the hour) is based on inputs, while Value-Based Pricing is based on outputs. Value-Based Pricing requires vendors to have a knowledge and understanding their customers’ value-chain and their value creation process, and this is achieved via long-term, sustainable relationships, rather than the odd transaction here and there. As a result, Value-Based Pricing is more holistic than alternative methodologies. It enables companies selling goods to monetise the services involved in the provision of such goods, while enabling service companies to shift their focus to the provision of solutions. The majority of companies I work with want to move to Value-Based Pricing so they can become the “price maker” in their industry, and reap the rewards that go with wearing that crown. Such a move also helps differentiate them, particularly in industries that are being commoditised or disrupted. Which brings me to the advertising industry, which is one of two major industries where customers are demanding a shift to Value-Based Pricing because the industry itself is refusing to go there (the other industry is Professional Services, such as Lawyers, Accountants and the like). The situation where customers demand Value-Based Pricing is not one you want forced onto you. It will catch you off-guard and force you to make mistakes that come with not planning ahead and being reactive to customer needs. You will be a commoditised “price taker”, constantly beaten up by powerful procurement managers. Perhaps more worryingly, there is a huge risk of polarisation across the advertising industry. Those that can provide value-based advertising solutions to customers will command premium pricing. And for everybody else, there’s “commoditisation hell”.